This picture leads to more questions than answers. 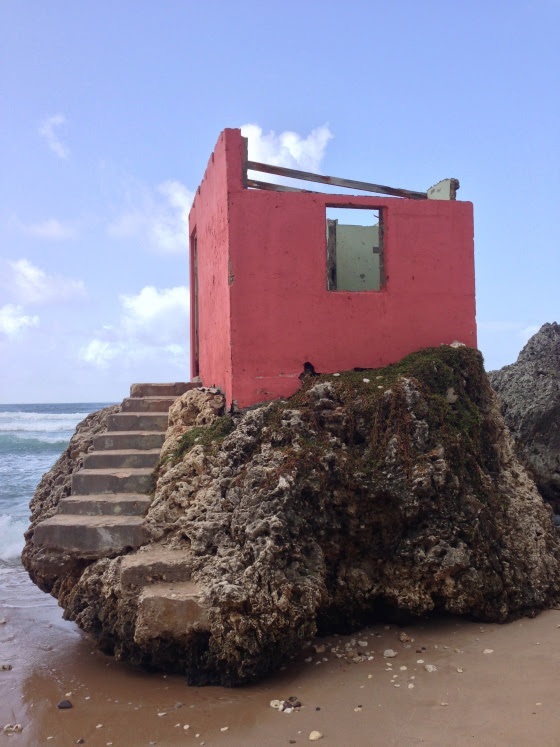 Time, erosion, one hell of a storm….how did this little building end up there, with stairs up the rock? I love the idea of it. When I saw it, I had to give it magical properties. Edna walked this beach daily, down and back. Their constitutional, they’d called it. She walked alone these days, widowhood a mantle she never claimed. Seeing the red room on the rock, Edna puzzled over how it came to be there. Dropped to earth, it seemed. She gave it wide berth for days, something ominous about it. Late one afternoon, she spotted a light glowing in the window. Cautiously, she approached to get a better look. A glow emanated from the doorway, and through it, she spied her husband, beckoning. A tentative first step, then another. At last, she was home. Erin, an interesting take on it. I like this line: ” widowhood a mantle she never claimed” and the way it works into meeting her husband again. Thanks, Janet! I had to figure out how to give her a back story in only a few words. I appreciate the feedback! Oh I really like it. It has a Twilight Zoney feel, There’s something menacing about it. Thank you, Linda – it just seemed like a portal to somewhere. I had to make it magical in some way. How lovely – she made the choice. Yes – I think she knew it was time to reunite. The ending leaves room for a lot of speculation. So is she dead now? Is he a ghost? A nice story, in any case. I see it as passing over to be with her husband – but leaving it open is part of the fun. Mysterious and beautiful, darling. Leaves a lot to ponder. I’m glad you enjoyed it. Your feedback is always appreciated! A portal to her lost love? Mesmerizing imagery! Thanks, Joe! Yes, a portal to his dimension – a way to pass over – all sorts of ways to look at it! Lovely take on the prompt, and lovely word choices. One particular thing I notice is that, even though you have just 100 words to use, you do not rush the story. It has the feel of the passage of time. A great feat with only 100 words to play with. Thanks, Sandra! I appreciate your feedback – it is good to hear you felt the story worked well! I like how this ended! Twilight Zone has already been referenced and now it will be again. 😉 I could see this one played out. Part of me wants her join her husband and the other part of me shudders at the thought. Well done and perfectly worded. She knew he wasn’t dead but why didn’t she go to him before? Or has she refused to believe he is dead until her mind creates him for her? Very well written Erin, you sadi so much in such few words.